399273 is rated 4.7 out of 5 by 7. Rated 5 out of 5 by super wrench Dave from heavy duty I have used this flexplate on my dragster before and with a msd starter and a 15 to 1 compression have not had any problems starting my 555. Rated 5 out of 5 by Skidaddy from TCI flexplate I bought this as a replacement upgrade for a o.e.m.flexplate that cracked. I am running a T400 TCI trans. with 2800 stall 10" torq. converter in back of a 350c.i. 300hp motor. All is well. Rated 5 out of 5 by Scooter402 from Yes Its better then what I had and feels heavier duty then the one I took off. Rated 5 out of 5 by YENKONOVA from Good solid piece. bought it about a month ago for my 468, smooth starts not any problems at all. Rated 3 out of 5 by ishibob from OOPS Always ran TCI flexplates in 3 of my race cars with no problems but this particular one had ONE mounting hole drilled wrong size. Had to enlarge it. Need a flexplate for a ls2. Whats the part number for that engine? 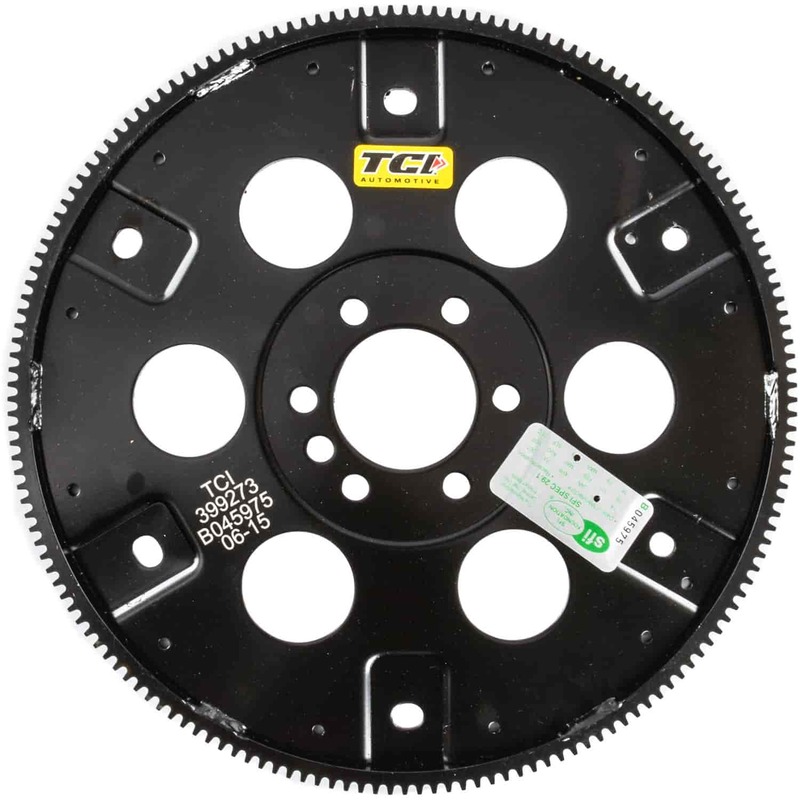 Thanks for the last answer - but, I'll ask again &quot;Which TCI flexplate has 10.75 and 11.5&quot; holes, 168 tooth, internal balance for Big Block Chev applications?'. TCI does not have a converter with those specifications. Hi, Normal 'dual-pattern' flywheels for Chev have 10.75 and 11.5 bolt patterns. This states &quot;10.75 and 11.1&quot;. Is that correct? If so, which TCI flywheel has 10.75 and 11.5 patterns in 168 tooth/internal balance for CHEV MarkIV BBC? &nbsp;Thanks. Will this bolt onto a 5.3l vortec? I have a Vortex 8100 engine, will this flexplate bolt onto it?